Shaolin Temple, or Death Chambers as it was sometimes released as, is what many would consider your typical Kung Fu movie. The basic plot is the destruction of Shaolin by the Manchu’s and how Shaolin started teaching outsiders to preserve their ways. Three peasants and five Ming Soldiers join Shaolin in order to defend themselves from the Qin’s and to protect Shaolin. What is really important about this film from a historical cinema point of view is it is the first film where the Venom Mob (the actors from Five Deadly Venoms) first star together. This film is also a prequel to Five Shaolin Masters (1974) . Even though there are a lot of characters they really don’t focus on just one or two and allowed them all to have a part in the film. 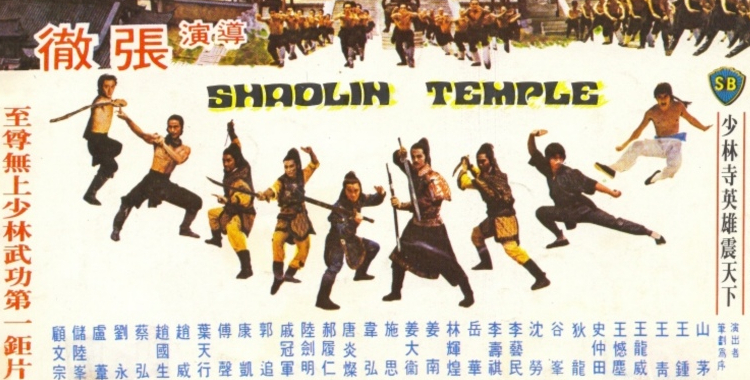 The eight Shaolin masters of Shaolin Temple, left to right – Wai Wang as Hung Hsi Kuan, Chi Kuan Chun as Hu Huei Chien, Fu Sheng as Fang Shih Yu, Ti Lung as Tsai Te Chung, Wang Chung as Fang Ta Hung, David Chiang Da Wei as Hu Te Di, Tony Lau Wing as Ma Chao Hsing, Yueh Hua as Li Shih Kai. Directed by Chang Cheh (One-Armed Swordsman 1967, The Water Margin 1972, The Brave Archer 1977, The Sword Stained with Royal Blood 1982) with his great eye for detail and amazing action sequences. The sets are lavishly done and we get to view many martial arts forms including some amazing Wing Chung, and Hung Gar. Currently Celestial Pictures Limited own the rights to the entire Shaw Brothers Library and they did remaster Shaolin Temple but it is out of print and hard to get ahold of. They only released it in DVD Region 1 & 3. I’ve only managed to watch really bad online versions of this film. A fun fan made video with fight scenes. This entry was posted in Historical, Martial Arts and tagged Alexander Fu Sheng, Bruce Tong Yim-Chaan, Chi Kuan-Chun, Chiang Sheng, David Chiang, David Chiang Da-Wei, Five Deadly Venoms, Johnny Wang, Johnny Wang Lung-Wei, Ku Wen-Chung, Lau Wing, Li Yi-Min, Martial Arts, Phillip Kwok Chun-Fung, Shan Mao, Shaolin, Shaw Brothers, Shih Szu, Ti Lung, Wai Wang, Wong Chung, Yueh Hua. Bookmark the permalink.